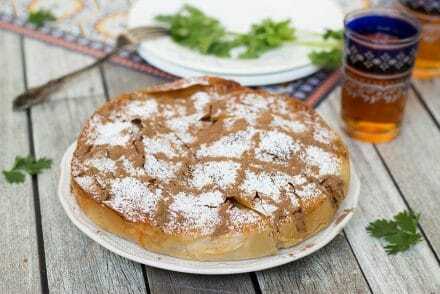 After making the famous Moroccan bread and iconic thousand holes pancakes (you can find both recipes inside the Morocco category) I just HAD to explore Moroccan breakfast in this #3 edition of the “Breakfast Around the World” posts series! This Northern African country is a unique mix of Arabic, European, African and Berber cultures, which makes its cuisine exciting too. 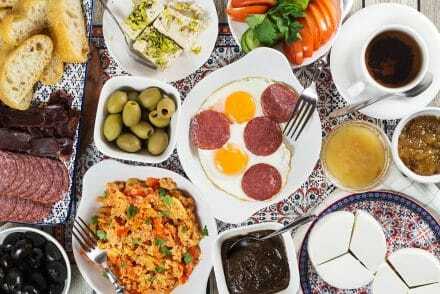 Let’s see what does Moroccan breakfast table look like! Morocco has a complex history that has strongly influenced its culinary traditions. Most probably the biggest impact comes from Frenchmen who (together with Spaniards) ruled the country for 50 years in the beginning of the 20th century. You can still see that influence by the number of French food options found in Morocco. Pain au chocolat, croissants, and other famous pastries born in France are ubiquitous there! Many of them are eaten for breakfast, however I decided to stick only with authentic Moroccan meals. I will explore all these French goodies when I will be making a French breakfast, right? 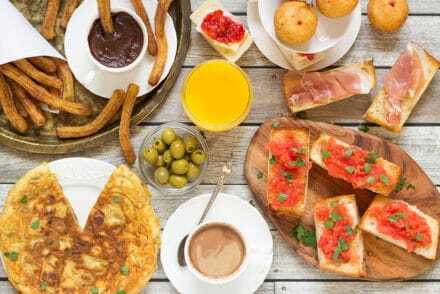 So, what foods help Moroccans to wake up every single morning? First and foremost it’s bread. Dozens of types of bread. In Morocco bread is eaten with every meal and breakfast is not an exception. 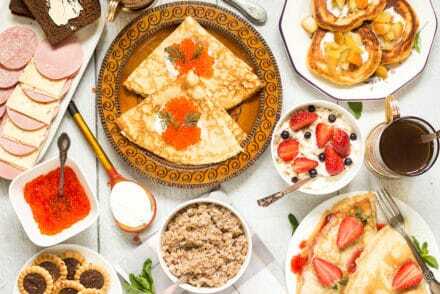 Pancakes and cakes made from semolina are also frequent guests on the table. Other Moroccan breakfast staples are fresh goat’s cheese and olives. 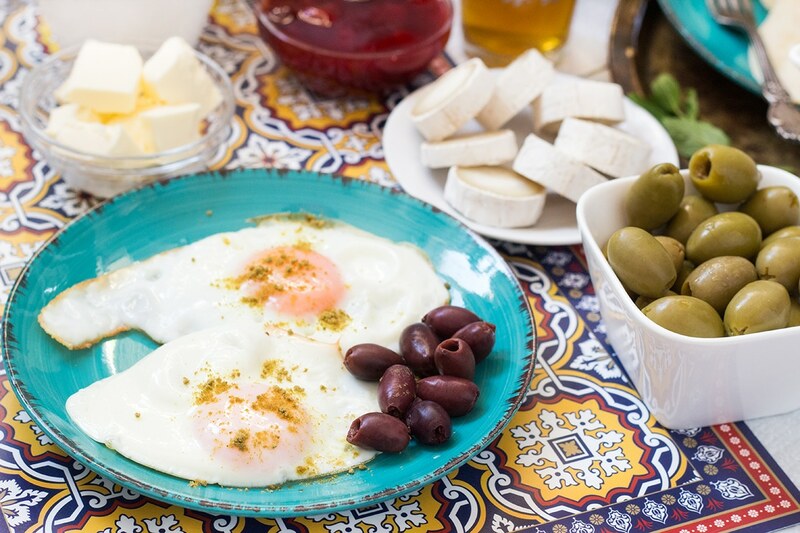 Such a popular in many countries morning meal option as fried egg is beloved in Morocco too! What about beverages? Freshly squeezed orange juice and of course the famous Moroccan mint tea. 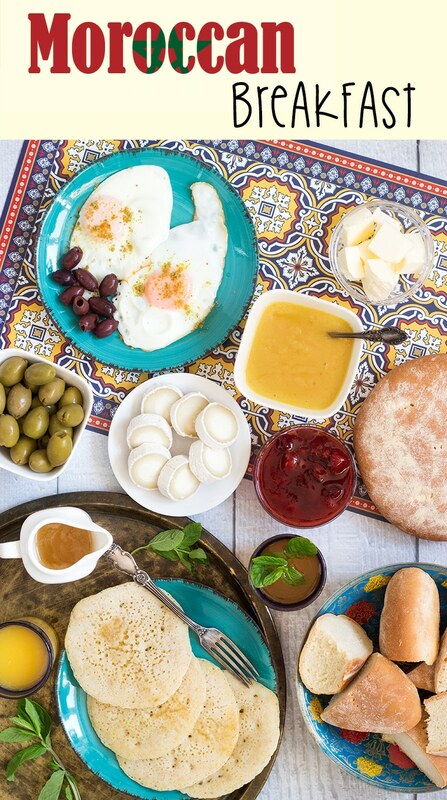 Let’s take a closer look at my Moroccan breakfast table! As I have already mentioned, bread is a cornerstone of Moroccan cuisine. It is literally everywhere. Bread has always played such an important role in the life of Moroccans, that they even have such a thing as communal ovens where people bring their own dough and bake it by themselves. Nowadays, in this modern lifestyle, when you can find a bakery that does all the job for you in every neighborhood, the popularity of these communal bakeries has decreased. 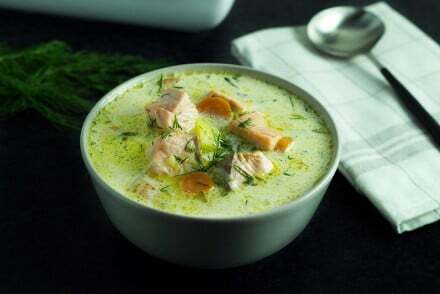 However, there are still people who actively use public street ovens or bake bread at home. 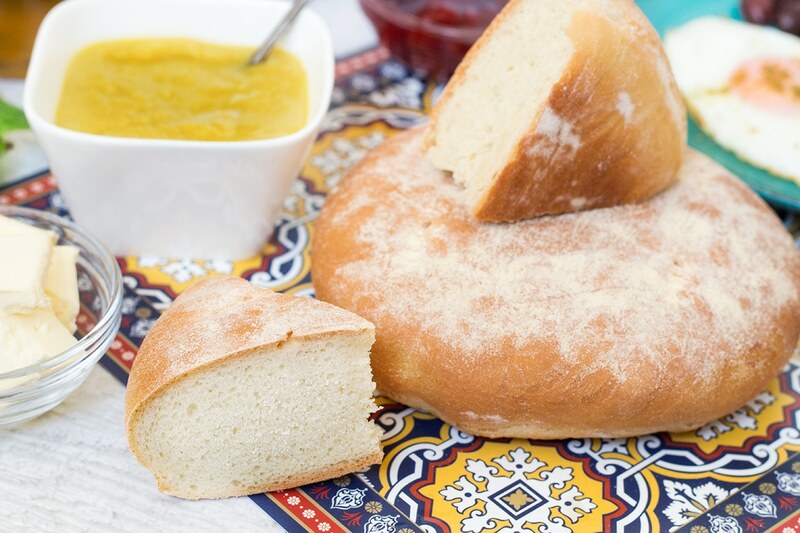 You can choose from a wide variety of Moroccan breads. The most staple one, and the one you’ll find on every corner if you’ll ever visit Morocco, is Khobz. That’s the one I made for this breakfast. Actually, I even created a separate post about this bread, because it’s really awesome. You can find it here. It has to be mentioned that Khobz is just a general Arabic word for any kind of bread. However in Morocco it usually refers to this specific round type of bread eaten every day. Khobz even replaces the cutlery: the crust is used to scoop up all the food in the plate, doesn’t matter if you are having a salad, tagine or other stuff, while the soft interior is ideal for dipping into sauces or, for example, egg yolk. Why do you need forks and spoons if you have a slice of freshly baked bread? Another major Moroccan breakfast staple. There is no breakfast without at least one kind of pancakes on the table. I made semolina pancakes with dozens of tiny craters called Baghrir. Once again, there is a separate post about them, which you can find here. They are cooked on one side only, and all these little holes appear because of yeast. It’s so cool! Another popular pancake in Morocco is Rghaif. Depending on how the dough was folded before the cooking it can be called by other names such as Msemen (very popular), Meloui and others. Pancakes are usually eaten with honey and butter mixture or jam. The most popular jam types in Morocco are strawberry and apricot. 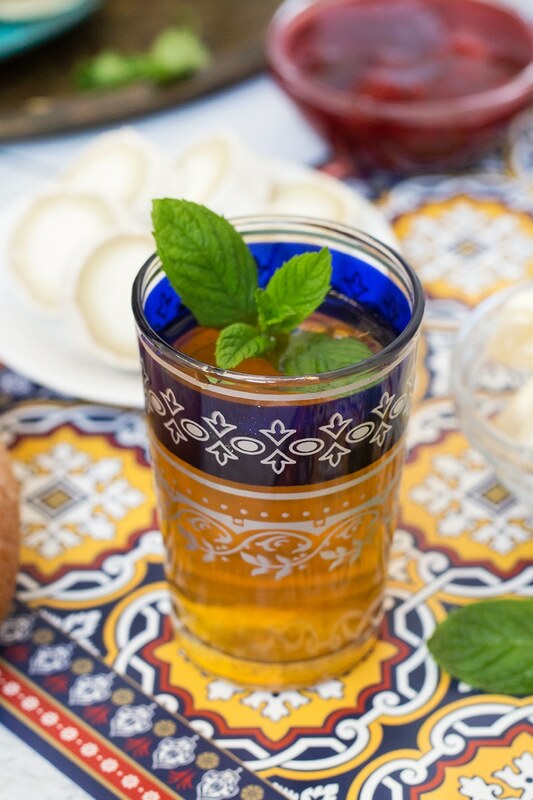 Mint tea is always the most important beverage on any Moroccan breakfast table. It’s a pure classic. 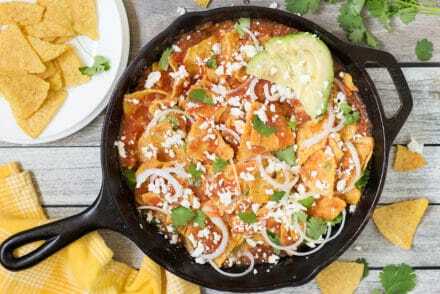 You can easily make it at home. Everything you need is gunpowder green tea, fresh mint and sugar. Loads of sugar! Moroccans love sweet things. If you want to know more about Moroccan green tea, I recommend you to read this very detailed post about it by Honestly Yum. Moroccans also can’t live without their fresh orange juice. Other juices are also popular, but the orange one is an absolute favorite. By the way, juices are also getting sweetened. As I said, Moroccans are going crazy about sugar! What is hidden behind this name? 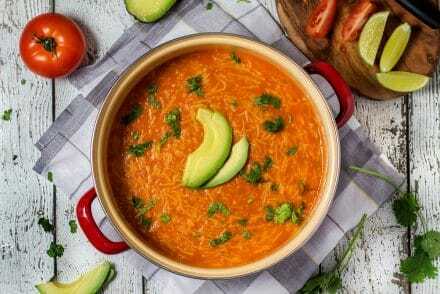 Amlou is a classic Moroccan dip made from almonds, argan oil and honey. It is usually enjoyed for breakfast. Argan oil is quite expensive because the process of producing this oil from argan tree nuts is very labor-intensive. The closest substitute would be walnut oil, but you can also use olive oil if you want. Mine Amlou is quite bright while you can find darker versions in the internet. I think that’s because I used almonds without skins while some recipes use the nuts with skins. 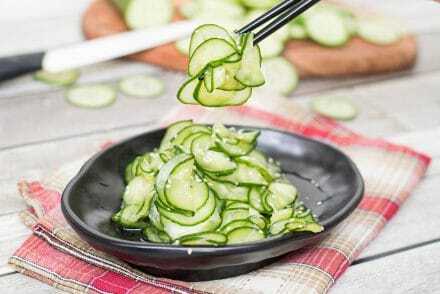 How to eat it? Just dip the bread into it and enjoy! The last but not the least – fried eggs. Yes, people in Africa love eggs for breakfast too! There are few differences from the way we eat it though. First of all, no bacon, sausages or stuff like that. You can have your eggs without meat at all (like me) or, alternatively, Moroccans can offer you their traditional preserved meat called Khlii (or Khlea). It is made from seasoned lamb or beef dried in the sun for few days and then cooked in animal fat, oil and water. Khlii can be stored for up to two years in a room temperature (!). Moroccans love it with fried or scrambled eggs. I didn’t make this cured meat because of the lack of time. However, I will someday! Just don’t forget to season the eggs with cumin and break the yolk with the bread. Oh and add some olives on side. That’s the Moroccan way of eating fried eggs! That’s it, guys and gals! I haven’t mentioned few things you can see on these Moroccan breakfast pictures because they are self explanatory: goat cheese (it’s popular in Morocco), olives and butter for slathering on bread. What can I say, I loved this breakfast! I would love to have some meat, but hey, I could make Khlii, can’t blame anyone for my laziness! Once again, if I screwed up somewhere, please tell me in the comments. 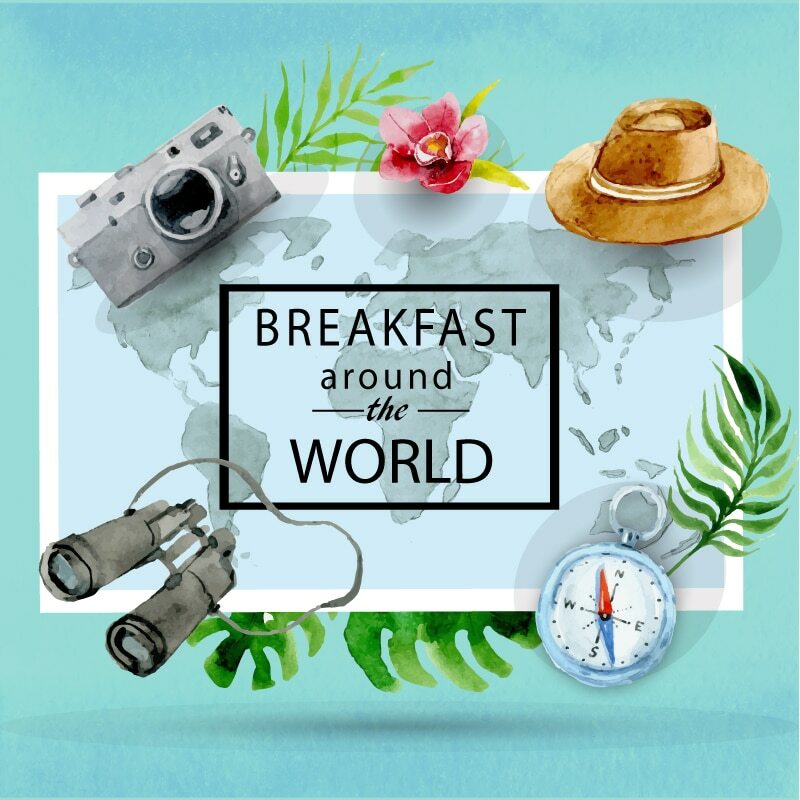 See you in other “Breakfast Around the World” posts! 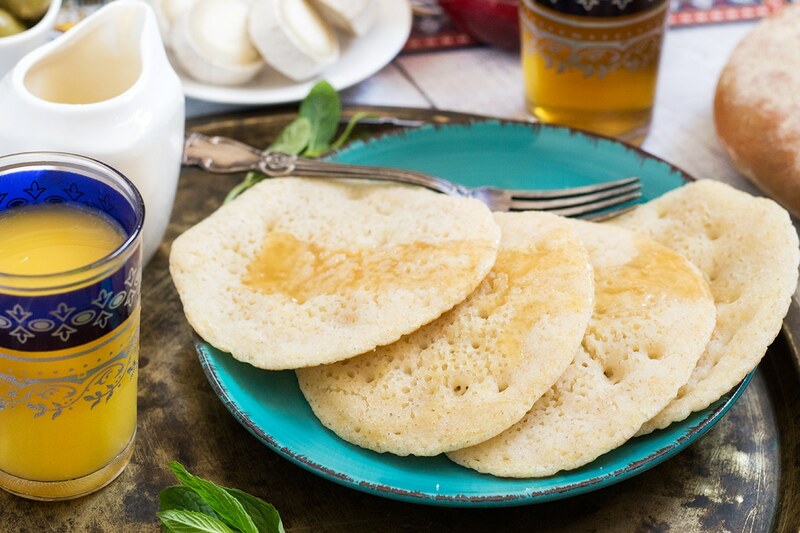 This North African breakfast features semolina pancakes, fried eggs, goat cheese, and of course the famous mint tea! 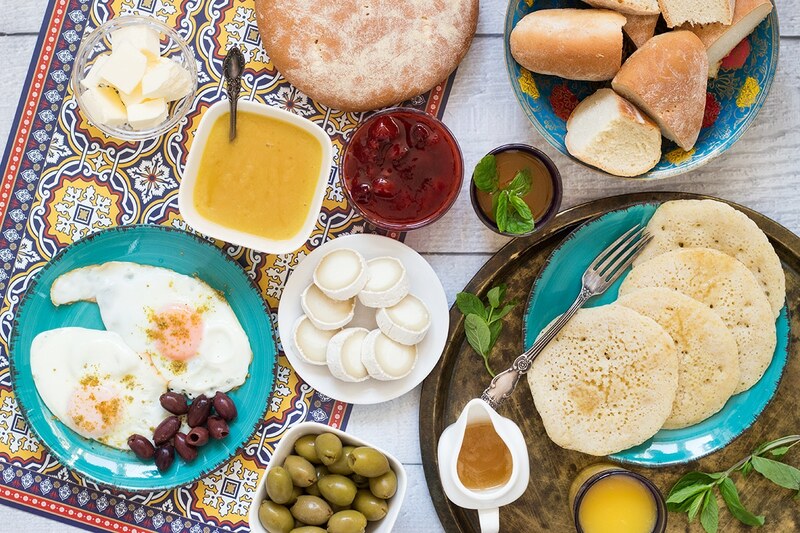 Serve all the items and enjoy your colorful Moroccan breakfast! When I lived in Morocco (Taroudannt), the standard breakfast consisted of khobz, Laughing Cow cheese spread triangles, hard boiled eggs (yuck! LOL! ), honey, amlou or jam (never both), argan oil (in Taroudannt) or olive oil (elsewhere) – for dipping bread into, olives, thinly-sliced oranges, dates, and mint tea (mmmm!). In all the time I lived in the country, the only places I saw goats’ cheese was in upmarket hotels, or Western-style supermarkets in Agadir, Essaouira, and Marrakech! There’s loads of freshly-squeezed orange juice around but in my experience, it wasn’t a breakfast drink, more, something you’d grab after shopping in the souk. I suspect that having it for breakfast is likely to be an aspirational thing. I could be wrong though – it’s just not something anyone I was friends with did. And neither did we! Same goes for pancakes, meat, and fried eggs. In fact, the only time I ever came across fried eggs was when they were supposed to be scrambled or made into an omelette (and weren’t! ), and in the few-and-far-between fast food places (barf!)! I suspect that what constitutes a ‘typical’ Moroccan breakfast depends on how affluent you are, and how much time you have. Certainly where I lived, where the only tourists were mostly bussed in for day-trips, things were a lot more basic. But saying that, even when I went on holiday to other cities, mostly, the fare was still quite plain. Perhaps I should have stayed in high-end resorts, and not small, family-run riads! By the way, I love your photos! A lovely write up. I have traveled many times to Morocco and you manage to bring back vivid memories of breakfast there. My love of Morocco and I have just opened up a Moroccan style bed and breakfast in Costa Blanca, Spain. Well done on the blog. Superb writing. 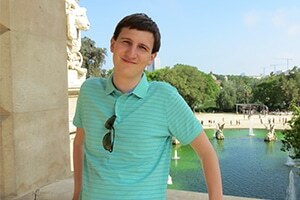 Hi Igor, just stumbled upon your blog and I have to say that I love your concept of making breakfast from around the globe! I’m crazy about breakfast. It’s my favorite meal of the day, and your blog is very inspiring. Love the photos, too! P.S. I checked out your website and it’s amazing! Great job! I am so happy to hear that I didn’t make too much mistakes 🙂 Thanks for your comment, Amel! Today I got a guest from Morocco.This is for the first time. By reading this blog, I am very grateful, this makes it easier for me to serve their breakfast. I am glad you found this post and the blog helpful!